Resource conservation is the planned management of natural resources to optimise their utility, efficient usage in their original application, reuse, and recycling. The aim is to minimise the energy consumed and wastes generated in all stages, from production through the life of the product right up to final disposal. Plastics are derived from natural resources - petroleum oil and natural gas. Plastic products have a fascinating, bewildering and even bizarre range of properties. They can be rigid, as well as flexible, they can provide retention (i.e. act as barrier) as well as selective tailor-made permeation, they are excellent insulators, but can also be made conductive. They can have memory and can be even optically active; they can be 'Instant' structural adhesives. They have high impact strength; they can have high abrasion and scratch resistance. The ease with which plastics can be processed into a variety of articles of every day use is truly remarkable, and has no parallel. Plastics are hallmark of conservation of energy compared to steel and glass, and have additional advantage of recycling. Natural Resources The wood used for furniture like tables & chairs, doors & windows, packing of tea, mangoes, grapes, apples etc, wooden crates for aerated water bottles, are now being replaced by plastics. An estimate indicates that if only 2% of the wooden boxes are changed over to plastic we would save 1,200 ha of forests involving 1,10,000 trees.Wooden plate & frame-filters used in chemical & allied industries can be completely replaced by plastic. Yearly consumption of Plastic chairs and Plastic Crates in India 2000 AD was about 50 million and 15 million, respectively. At this rate saving over a period of 10 years would be close to 20 million trees. Cork used in a variety of applications like caps of aerated water bottles can be replaced by plastic. The nursery for forestry also benefit from plastic films. Cotton and jute, in most applications can be replaced in a very effective and profitable way by woven sacks made of high density polyethylene or polypropylene. A lot of wastage associated with use of packaging jute bags for cement, fertilizer, pesticides, etc can be avoided by using waterproof plastic sacks. Plastics are used in a host of applications in the field of agriculture e.g. plastic pipes in sprinkler irrigation systems, plastic films in green houses, plastic nets in horticulture, heavy duty flexible membrane lines for canal lining which prevents water seepage- (It has been reported that 0.75 mm PVC sheet provides a million times more permeation resistance than 1m of clay as canal, dam and lake liner). Super absorbent polymers in our arid, and semi-arid zones, all help substantially to conserve water - a precious natural resource, to a great extent. Fishing nets made of plastics have a long life. Even ropes are made entirely of polypropylene or polyamide, and these have a long life compared to other conventional ropes. FRP boats have made a definite impact in the fishing industry. Polymeric membranes have made major impact in recent years in desalination of sea and brackish water. We now have large-scale plants providing drinking water to the public. Here the net consumption of energy, compared to multi-stage evaporator based system is very lower, and hence saving of energy is substantial. The availability of potable water in a number of arid and semi-arid areas in Rajasthan, Gujarat, Tamil Nadu, Andhra Pradesh, etc. is serious problem of society, and polymers' contribution in tackling the issue is very great. Many cryogenic operations, for e.g. pure or enriched nitrogen and oxygen, can now be based on polymeric membrane separations or hybrid systems resulting in enormous power savings. Enriched oxygen can be supplied for industrial purposes like boilers, klins, furnaces etc. resulting in saving of substantial energy. Even in hospitals enriched oxygen is being supplied through membrane based modules. Energy consumed on a functional basis, by a unit amount of plastic, (polymers like LDPE/HDPE/PP/PS) which have densities which is about one-seventh of that of steel, is very much lower than that required for steel, and aluminum (aluminum requires 13 times its weight in energy to produce 1 lb from ore, steel six times). Plastic do not need frequent painting. This is another saving. In many applications steel and aluminum can be safely and profitably replaced by plastic at lower cost and in saving Capital Investment, which we are always in short supply. Plastics (HDPE) pipes can be conveniently and advantageously used for transportation of industrial gas, effluent pipelines where liquids may be acidic and corrosive, and avoid the aberration that we will have through the leakage of metal pipes. Frictional losses in plastic pipes & fittings as a whole and pipes for sprinkler irrigation systems are less, which adds and to substantial saving of energy. Replacement of asbestos and corrugated iron sheets by transparent/ translucent FRP sheets that provide daylight as well can result in saving electricity. Another welcome change is replacement of blades of fans (ceiling, table & pedestal) with plastic based material, as it will save substantial energy. According to American sources only 4% of United States energy consumption is actually used to produce plastic raw materials including feedstocks. It takes less energy to covert plastics from a raw material into a finished product as compared to other products. E.G. Plastic bags require only one-third of the energy required to make similar paper bags. Foamed polystyrene containers take only 70% of the energy to make paperboard containers. Fifty-three billion kilo watt-hours of electricity are saved annually by improvements in major appliances. Energy efficiency has been made possible by plastic applications. (a) Plastic film wrappers now used for large diaper packs need only 50% by volume, than previous packs. (b) In the US 4 million students a day drink their milk or juice in flexible pouches which reduce weight by 80% and volume by 70% as compared to traditional cartons, reducing storage and trash disposal costs. (c) Plastic grocery bags are lighter and create upto 80% less waste by volume than paper sacks, and are recyclable. Because of durability, flexibility and increased life span, plastic bottles etc can be reused several times, eg. Packings for laundry products etc. The lightweight nature of plastics helps to reduce transportation costs substantially. A truck that could carry only 5,00,000/- paper grocery bags can transport 2.8 million plastic grocery bags. Container breaches, denting and product loss on the package lines during handling are substantially reduced because of plastics' superior resistant to breakage and denting. Increased productivity by about 20-30% and reduced capital expenditure to the extent of 50% can be achieved due to highly superior manufacturing efficiency of plastics. Corrosion resistance will increase the life of major appliances by about 40% resulting in substantial savings. The automotive industries choose plastics for their durability, corrosion resistance, ease of colouring and finishing, resiliency, energy efficiency and lightweight, which reduces handling and transportation costs. Ease of fabrication and outstanding thermal insulation, reducing energy consumption are the prime considerations for major appliances manufactures for using plastic. Aesthetic appearance, durability, ease of installation and energy efficiency are the prime factors for the building and construction industries to use plastic. Some of the experiences of the US plastic industries as reported are: Less waste - Plastics often help product manufactures to do more with less material, which is known as 'resources efficiency' or 'source reduction'. Source reduction is the process by which a package or product is made using fewer resources, creating less pollution and utilising fewer potentially toxic ingredients. "Plastic Engineers have helped manufacturers make production using less material by lightening and thinning consumer product packaging. Just 2 lbs plastics can deliver 1,000 ounces - roughly 8 gallons - of beverage such as juice, soft drink, milk or water. In its place we will need 3 lbs of aluminum to bring home the same amount, 8 lbs of steel or 27 lbs of glass". "Plastics help make packaging more efficient, thereby conserving resources. As a result, the consumer can buy larger, economy size products (eg: laundry detergents). It also means that it takes fewer trucks - and therefore less fuel - to get the products to the consumer. For example: It takes seven trucks to carry the same number of paper bags that fit in one truck load of plastic bags". "Reuse provides another significant way to conserve resources. Plastic's durability allows many products and packaging to be reused over and over again. Not surprisingly, in a 1977 Survey, Wirthlin Worldwide found that more than 80% of Americans reuse plastic products and packaging for their homes. Plastics are durable, making it a material of choice for commonly reusable items, such as food storage containers and refillable sports bottles. Reuse of plastics reduces trash disposal costs, and extends landfill capacity. For example: as much as 40% of certain plastic parts from damaged or discarded cars are repaired and reused, reducing the amount of automotive components sent to landfills. Laundry products are also being packed in reusable plastic bottles and small refill packages of concentrated products - helping to reduce packaging waste". "Many US businesses have made the decision to receive their supplies and ship their products in reusable plastic containers (RPSCs) rather than single use corrugated boxes. Over the past two years, the Ford Motor Company has eliminated more than 150 million pounds of wood and carboard packaging that would have gone to landfill, by asking its suppliers to use returnable plastic shipping containers and plastic rather than wood pallets. Returnable containers are also making major inroads in the produce and meat packaging industries". In the United States there are now 103 energy recovery plants operating spread over 32 states, generating enough electricity to meet the power needs of 1.2 million houses and businesses. Primary function of packaging is to help protect the quality of goods - all marketable products, viz., fresh meat and vegetables and prepared foods, industrial, equipment, sensitive electronics, etc, during shipping, handling and marketing. Because of the versatile nature of plastics they are most suitable for a wide range of packaging applications. 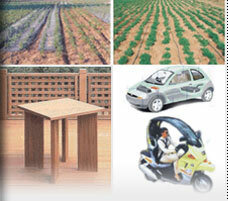 Plastics offer best protection while using minimum resources, creating less wastage. As compared to other conventional packaging materials, plastics have minimum weight to volume ratio. Globally around 40%(which may shortly go up to 60%) of polymers are used in packaging. Polyethylene is the main polymer used for packaging. Plastic being so versatile, each resin has attributes that makes it best suited to a particular application. The following six resins account for nearly all plastics used in packaging. PET (polyethylene terephtalate) is a clear, tough polymer with exceptional gas and moisture barrier properties. PET's ability to contain carbon dioxide (carbonation) makes it ideal for use in soft drink bottles. HDPE (high density polyethylene) - Because of its excellent protective barrier properties it is used for milk, juice, and water containers. Its chemical resistance properties make it ideal for containers for household chemicals and detergents. Vinyl (polyvinyl chloride) provides excellent clarity, puncture resistance and cling. As a film, vinyl can breathe just the right amount, making it ideal for packing fresh meats that require oxygen to ensure a bright red surface, while maintaining good shelf life. LDPE (low density polyethylene) offers clarity & flexibility and is used to make bottles requiring flexibility. It is used to make grocery bags, garbage bags, shrink and stretch film making use of strength and toughness in film form of LDPE. It is also used as coating for milk cartons. PP (polypropylene) - Because of it high tensile strength it is ideal for use in caps and lids that have to hold tightly onto threaded openings. PP has high melting point, can be hot-filled with products designed to cool in bottles, including ketchup, and syrup. It is also used for products that need to be incubated, such as yogurt. PS (polystyrene) in its crystalline form is a colourless plastic that can be clear and hard. It can be foamed to provide exceptional insulation properties. Foamed or expanded polystyrene (EPS) is used for making meat trays, egg cartons, coffee cups etc and also used for packaging and protecting appliances, electronic and other sensitive products. Plastics help make packaging more efficient thereby conserving resources. Q) Can plastics actually help save energy ? were replaced with alternatives ?